With family and friends in South Florida, when the Steelers play the Miami Dolphins, I try to attend the games. Back in 2010, I went to the Steelers-Dolphins game and purchased group tickets since I knew enough people that also wanted to go. Back then, tickets cost $52 for the Upper End Zone seats. This was a higher price than other games that season since there was a higher demand for the Steelers game. As you can see, tickets for the Steelers-Dolphins game is the most expensive game along with when the New England Patriots take their talents to South Florida. The same Upper End Zone seats are just about double from 6 years ago at $102. Throwing in airfare, I think $102 (plus parking, food, etc) might be too much for me for me this year. However, the one thing I noticed is how inexpensive a ticket is to see the Dolphins host the Arizona Cardinals (coming off an NFC Championship game appearance), Tennessee Titans, and Cleveland Browns. These ticket prices probably make it the only time where you can say it is good to be a Browns fan! 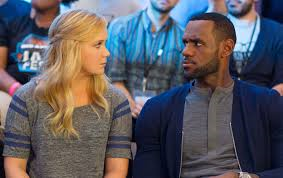 Of course, the big questions is will Miami and Cleveland fans both wear LeBron James jerseys to the game? Back in November, I took my then 4 year-old son to his first college basketball game: George Mason vs. Colgate. Unfortunately, we left early since my son wasn't feeling well (it wasn't a good sign that he fell asleep in the car on the way to the game), but while he didn't say much during the game and wanted to sit on my lap the entire time, he talked about the game for days. 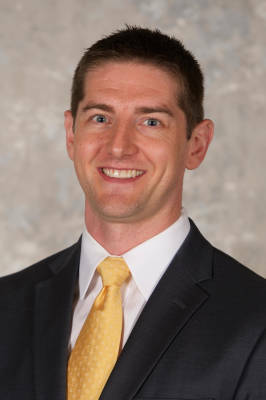 Anyway, at the game, I picked up a program and noticed that the bio for one of the assistant coaches, Dane Fischer, stated that he graduated from Ithaca College. Well, I graduated from Ithaca College too. There aren't many (any besides Dane?) Ithaca College grads working as D1 basketball coaches, so I wanted to learn more about Dane and how he went from Ithaca to Mason. Dane was gracious enough to answer my questions. Enjoy! How did you go from a Business major at Ithaca College to an assistant coach at George Mason University? When I graduated from IC I was offered a job as a Financial Advisor with Edwards Jones. It was a great company and I really liked the job, but it wasn't my true passion. I worked in that position for about 10 months before deciding to pursue a career in college coaching. It was the best professional decision I've ever made. 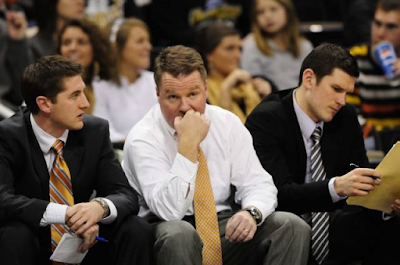 Did you have a big adjustment going from the Patriot League to the Atlantic 10? Any time you change leagues there is an adjustment. It takes some time to learn the different styles of play and tendencies of the coaches. The biggest change on the court is the overall athleticism of the players. It is also a significant change going from a league with 10 teams to a league with 14. What are your responsibilities as an assistant coach? Do you have a particular focus on recruiting, scouting, player development, or all of the above (or something else I'm missing)? As assistant coaches we all share responsibility in recruiting, scouting and player development and try to bring ideas to Coach Paulsen that we think can advance our program. 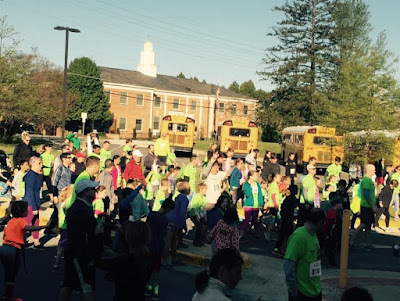 Both personally and professionally, what did you think about your first year in Fairfax? Too much traffic! Personally - Fairfax is a great place to live. It's a lot of fun being close to DC and all that comes along with it. There are a ton of great restaurants and my wife and I really like it here. Professionally - The people at George Mason and in Fairfax have been fantastic. The support for our basketball program is really impressive and we are excited for what lies ahead. It seems like GMU may have been one of the youngest teams in the country. What do you expect from the team for the 2016-2017 season? Believe it or not, we are going to be even younger next year. As of today, our roster will be comprised of 10 freshmen and sophomores in 2016-2017. Our team made some nice strides this past season but we will probably experience some of the same growing pains next year as we did this year. Hopefully our culture continues to move in the right direction and with that comes more success on the court. Since all of your home games are at Eagle Bank Arena, do you get free tickets to events there? Sesame Street Live tickets would be an awesome perk! I was an international business minor at IC and all I remember is that nearly every class involved the importance of learning and understanding the culture of a particular country or environment. So, um, did you learn this too at IC? Have you been able to use any aspects of business education as a coach? I was a finance major so most of that material doesn't apply to coaching. I did learn a lot from my management, organizational behavior and computer classes that I apply on a regular basis to coaching. Do you make it back to Ithaca much? Are there any potential recruits in central New York so you can make an excuse to stop by Ithaca for Rogan's pizza? 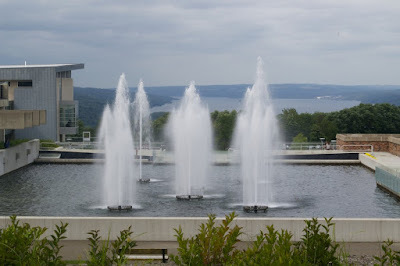 I've been back to Ithaca a few times in the past couple of years. The coach I played for (Jim Mullins) is still the head coach there so it's fun to go back and connect with him. Also, one of my good friends from Ithaca is the defensive coordinator for the football team so I've been back to watch his team play. We signed a recruit from Syracuse, NY this year but unfortunately it didn't lead me to any trips to South Hill! Finally, where do you see yourself in 5 or 10 years? 5-10 years from now is hard to answer because of the unpredictability of our business. Hopefully I'm coaching at a great school and part of a winning program that does things the right way. Thanks again to Dane for answering my questions. Feel free to follow him on Twitter and go out to see Dane and the GMU Patriots in action next season. Photos from GoMason.com, GMU Hoops & Ithaca College. 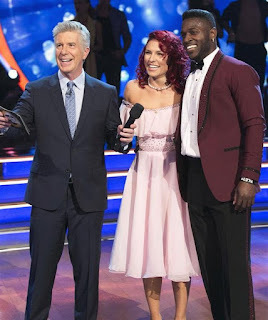 I have been gifted the opportunity to take over this blog to share my thoughts on the recent Dancing with the Stars (also known as DTWS) episode. Being a huge fan of dance, this show, and of course Sean, there is a lot on my mind to share. So, why did Sean ask me to blog? (Sean's note: Besides the fact that I don't write as much as I used to and thought Kim would write a fun post about Antonio Brown & DWTS?) I think it might be because a certain star Wide Receiver of the Pittsburgh Steelers, Mr. Antonio Brown, is currently on the show and we have been chatting about it. Little known fact, it might also be because Sean is also a huge fan of dance, as proven by his stellar performance in the Jazz Dance class we took together in college. So let's dive right into Mr. Boomin's performance on last night's show. DWTS likes to have theme nights. (Monday) night was no different, and the theme was to recreate epic dances from movies and music videos. Antonio danced a jive to Footloose, from the movie by the same name. I must say - his flicks and kicks were on point, and he had charisma for days. Last week, the show knocked his lack of work ethic and even his own partner predicted they would not win the show. They had a heart-to-heart and apparently worked hard all week, because the dance was filled with energy and well executed dance moves. He got a 27 out of 30 and was not in the bottom 3. I predict Mr. Boomin' will make the finals on his natural dance ability, his giant smile and probably the huge "Stillers" fan base behind him. Next week we lose 2 couples on DWTS and I predict Paige VanZant and Kim Fields are probably not long for this show. Overall, this has been a great season of DWTS because there are so many talented celebrities and the pro dancer that usually makes the finals every season (Derek Hough) is not competing. Both of these factors plus Antonio's smile have made this a standout season. Thanks again Sean for the opportunity - hope y'all watch next Monday! For the second straight year, I ran a 5K with no training whatsoever. However, my time this year was about 1 minute and 30 seconds more than last year. I could blame my left ankle that I somehow tweaked on a wet hill the day before or the fact that I'm a year older. Instead, I'm going to blame my 5 year old, AKA, The Moose. On Sunday morning, my son woke up with a rash on his chest and back. This was probably due to the fact that he wore his brand new soccer shirt to his game...in the rain...and then for another 90 minutes after the game courtesy to team pictures. Upon seeing this rash, we decided that a trip to an Urgent Care was necessary. The doctor confirmed that it wasn't contagious and that it probably was a reaction to food or something else (like wearing a brand new, wet shirt for about three hours). With that news, we went straight to the race. For the race, the plan was that I would run the 5K while my wife would walk the course with a stroller for the kids. This worked perfectly for the first 20 minutes or at about the time that I was running on one side of the road while my family walked on the other side. Apparently, just waving hello wasn't enough. My two year-old (Pedro Tulo) started crying and The Moose yelled for me. I stopped and The Moose decided that he wanted to run with me. We ran for about 30 seconds with him holding my hand. Actually, ran might not be the right word. It was more like me running slowly while dragging him along. I accepted the fact that I was going to miss out on 5K glory and finishing in record time (though apparently not in record time; see below) to run with him. It was going to be a nice father-son moment. However, The Moose decided he wanted to go back with his mom and brother. Before saying goodbye though, he gave me a high five. Then asked for a hug. And then a kiss. It was very sweet, and I'm now accepting offers from Hollywood to make a movie about this. I then continued running. So now for the information you want to know. - I finished the 5K in 31:27. While slower than last year, when I ran this race in 2012, I finished in 31:34. So I'm 7 seconds faster now and that doesn't even include the approximate 12 minutes (give or take 11 minutes) I spent with The Moose which slowed me down! - Overall, I finished 131st out of 253 runners. - I also finished 33rd out of 47 men between 40-49. What the heck? I moved up to this division this year and figured my (relative) youth would help me dominate this age group. Apparently not. Oh well. I guess I'll have to wait 10 years to dominate the 50-59 age group. - According to online results, the winner was a boy under the age of 8. He completed the 5K in an unbelievable 6:40. Yes, that's an average of a 2 minute and 9 second mile. 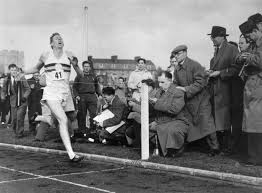 Roger Bannister who? - I bought new running shoes on Thursday night just for the race. I wore them all day Friday to try to break them in and that seemed to work. - For entertainment, I listened to a Bill Simmons podcast with Chuck Klosterman where they discussed Prince. Really good stuff. - The post-race bagels looked really good. Of course, every bread product looks really good during Passover. Fortunately, they also had fruit. - My ankle bothered me all Sunday and into Monday particularly walking down steps. With a completely healthy ankle and not being held back my son (and maybe a little training), I could have easily defeated the kid who ran the 5K in 6:40. ARLINGTON, Va. (ABC7) — A man was shot outside of a Burger King in Arlington late Wednesday evening, according to Arlington Police. Police say the 20-year-old man was transported to a hospital with non-life threatening injuries. The Burger King where the shooting took place is located in the 3600 block of Columbia Pike. While the story doesn't mention any suspects, I hope the police consider all possibilities. You don't want to mess with the Angriest Whopper! Alexander Ovechkin is a very good hockey player. The 2004 #1 overall draft pick has over 500 goals and has led the league in goals scored the past 4 seasons. This season, Ovechkin's Washington Capitals had the league's best record and now lead the Philadelphia Flyers 3 games to 0 in the playoffs. Naturally, Ovechkin is popular in the DC area and really, really, really popular with this driver. Please excuse the terrible picture. The license plate reads OV4PRZ with the Caps logo. While the current slate of Presidential candidates may be underwhelming to many, I'm a little concerned about this driver supporting Ovechkin. First, Ovechkin was born on Sep 17, 1985 meaning that he's not 35 as required. 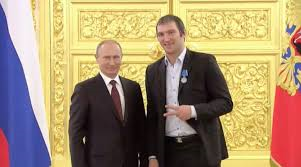 In addition, Ovie was born in Moscow and is still a Russian citizen. While being born outside the US doesn't seem to be an issue for Ted Cruz, the fact that Ovie is not a US citizen may be problematic. Assuming he runs as a Democrat, he will easily win the Washington DC vote. Even if he runs as a Republican, he could do the unthinkable and win DC. I think he'll also do well in Maryland and Virginia, but he faces major hurdles outside of the DC area. He's not going to do well in Pennsylvania though his candidacy could do something special. Ovie can bring Penguins and Flyers fans together in the common bond...of disliking him. Everyone together now! After thinking about this even more, perhaps the driver isn't referring to Ovechkin moving into the White House. Maybe the driver really wanted Ovie and the Caps to win The Presidents' Trophy for the team with the most points during the NHL regular season. Mission accomplished! The first thing that jumps out is the Steelers playing on Thanksgiving, Christmas and New Years. However, the Steelers also play on other national holidays: Chocolate Milkshake Day (Sept 12), Fire Prevention Day (Oct 9), my half-birthday (Nov 13) and Bake Cookies Day (Dec 18). September 12: I really thought the Steelers would play in Washington on the Monday night before election day like they did in 2008. Instead, the Steelers play in Maryland on the first Monday night of the season. I look forward to seeing all of the Metro outages and delays during a regular Monday evening commute, first home football game, and a 7:05 Mets-Nationals game. Might as well throw in a Presidential debate in DC that night as well as a World Bank meeting, Pope visit, or nuclear summit at that time too. In a bit of a schedule quirk, the NFL scheduled the Steelers against all three other AFC North teams twice. September 25: How many times do you think we'll hear the Battle of Pennsylvania the week of the Steelers-Eagles game? October 16: Time for a repeat trip to South Florida for a Steelers game? The Dolphins group ticket guy has e-mailed and/or called me weekly over the past month. He also emailed me on Thursday to let me know the exact time the schedule would be released. October 23: The return of Woodland Hills graduate Rob Gronkowski to Pittsburgh. Some quarterback named Brady will probably be there too. November 13: Steelers-Cowboys. Let's go back to the days of Roger Staubach and Mean Joe Greene. Tom Laundry and Chuck Noll. Steve Pelluer and Mark Malone? December 4: The Byron Stingily game. This will almost be as big as when Brett Favre returned to Green Bay as a member of the Vikings. Long-time Steelers offensive lineman Stingily, who we all remember for playing as many snaps for the Steelers as me, seeks revenge against his former team. January 1: Steelers fans get to see first-hand the annual week 17 game of "Who Is The Cleveland Browns Starting QB?" RG3 has the early edge, but I think Bernie Kosar has a good chance to start. I pick up The Fairfax County Times nearly every week at the Metro station. 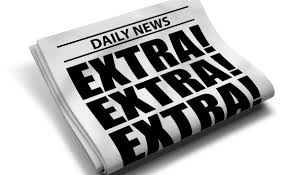 The paper provides a list of events going on in the community, stories about local government and schools, and it's a free publication with a coupon section. I'm a fan. Anyway, in the April 8-10 edition, I noticed this article titled "Sports betting, the new American pastime" in the Sports section directly next to a story about George Mason's women's lacrosse team defeating Richmond. This article by Geoff Freeman may be hard to read, but the premise is that gambling on professional sports should be legal. I don't disagree with this article, but it seemed odd to appear in The Fairfax County Times particularly after the NCAA Tournament ended and well before the football season begins. Therefore, I did a quick Google search on Mr. Freeman and learned that he is the President and CEO of the American Gaming Association. This isn't mentioned anywhere in the story or the by-line though that certainly seems relevant. I decided that more research needed to be done here, so I contacted both The Fairfax County Times and the American Gaming Association. I wanted to know if Mr. Freeman was paid for this story or did the American Gaming Association pay The Fairfax County Times for the story. Basically, was there funny business in the journalism industry here? This was going to be the scoop of the century and bigger than the Panama Papers. It was an article submitted to us by Mr. Freeman for publication. "Special to the Times" simply means the author is not an employee of our paper. In this particular case, Mr. Freeman was not compensated. Informed readers should always research the source of any article, as you did, and I encourage everyone to do so, as it helps to keep democracy healthy. We had another print article about sports betting in that same paper with a different take on the subject, but that article was not published online due to the limited licensing rights of that author, which allow for printed publication only. We often try to publish different--and occasionally conflicting--viewpoints on any subject. Well, that's not very exciting. I mean, this makes sense, but I was hoping for a major scoop. Fine, I'll just write that I haven't heard back from the American Gaming Association meaning that something sinister is up! My friend Sista K recently posted on Facebook that Meghan Trainor's No "is my current jammmmm." Although we have similar taste in music, I have to disagree with Sista K on this one. This also seems like the perfect opportunity to bring back the Sean Analyzes Song Lyrics series. Superman can fly, has X-ray vision, is faster than a speeding bullet, can leap tall buildings in a single bound, and is basically the greatest superhero of all time. However, apparently he has nothing on Charlie Puth. I guess Puth can do all this and is resistant to kryptonite. That's an unusual name. Is it short for a Nor'easter? Who even asks about signs anymore? Anyway, I'm familiar with the Zodiac system, and there's no such sign as no. Now this could be clever. No can be short for number like "This song is not going to be No. 1." I'm guessing that's not what Meghan is going for meaning that, like the Zodiac signs, no is not a number. Oh, let go. I get enough "no" responses from my toddler. When I typed Work Rihanna Lyrics into Bing, this is what appears. There is no way this is correct. Rihanna is incoherent by the end. It honestly just sounds like she's babbling. I need to let it go. 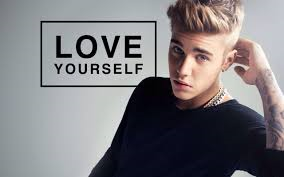 I hate giving Justin Bieber credit, but this is a well written song. Except for one tiny thing. 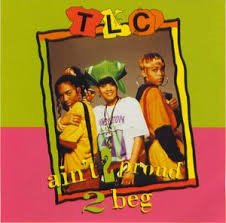 I can't get past ain't. It's not like sake and ain't rhyme. "I'm not" would work just fine here instead. I assume this is a reference to Naomi Campbell and not Naomi Watts or Naomi Judd, right? I guess there was something between Diddy and Campbell? If there was, it certainly wasn't as newsworthy (or song lyric worthy) as Diddy and J-Lo. So what are your thoughts on Trainor's song? Yes or no? There is a lot of money to be made by the athletes and I assume by the event organizer. It costs $100 to get an 8x10 photo with Antonio Brown. While I don't think it's possible for Brown to take a bad picture, I wouldn't want to pay $80 for a picture with Kevin Greene if he looks like unhappy. My question is why are there so few baseball, basketball and hockey players? Actually, there are no hockey players and the only baseball players are Juan Marichal, Dale Murphy, Gaylord Perry, Frank Robinson and Pedro Sierra compared to dozens of football players. Oh, and William Shatner will be there for some reason. You'll notice that I didn't include the actual name of the event or a website link since I'm not necessarily promoting this event. If the company wants me to promote the event, I'm more than happy to do so...for the right price. If Katherine Heigl wasn't an A-list celebrity about 8 years ago, she was on the high B+ list. Grey's Anatomy was the #1 show in the country, and Heigl was the star of Knocked Up (with Seth Rogan) and 27 Dresses (which I assume is a prequel to Sandra Bullock's 28 Days; I didn't see either movie). Heigl's career seems to have gone in a different direction lately. You probably already forgot about her role on NBC's cancelled show, State of Affairs, but she's back as you've never seen her before. Yes, that is Heigl acting as a therapist in a Cat's Pride Cat Litter commercial. She also appeared in the coupon section from last Sunday's newspaper where you can get money off your purchase of Cat's Pride Cat Litter. As someone with a cat, I applaud Heigl's efforts in making sure people know the importance of good cat litter. And if you think I'm angling to appear in a sequel to this commercial, you're probably right. Today’s post comes from Jenilee Dunson, a geek, otaku, and lover of all things kawaii (I have no idea what this means) who also writes about video games, anime, tech and toys at Geeky Sweetie. This is part of a special day of shenanigans from other Pittsburgh Bloggers. You can see my post over on Lunges, Long Runs and Lattes where I share my attempt to finally become fashionable. Are you looking for something different to do in downtown Pittsburgh? How about a fun night of games for the whole family? Arcades are a dying art in the United States which makes them increasingly hard to find - especially to find a well maintained arcade without a lot of outdated or worse yet, out of order, games. And when you find a good one, it's like a step back in time to your childhood or for younger kids, a glimpse into a forgotten era. The following list will examine 10 different arcades in the Pittsburgh area to try to help you decide which arcade is right for you. 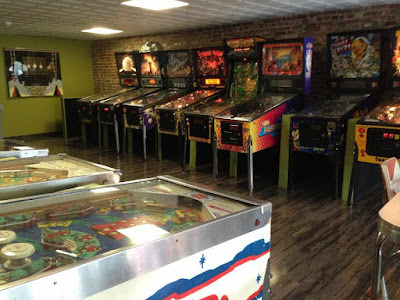 We'll start our list with number 10 and build anticipation for what we believe is the best Arcade in Pittsburgh. 10. Laser Storm Pittsburgh located at 7715 McKnight Rd, Pittsburgh, PA 15237. This is a great experience for the whole family. They have an awesome rock climbing simulator that is a must try one of a kind experience. They also have numerous arcade games and as their name suggests - a huge, award winning laser tag arena. All of their units are well maintained and the building is clean and well lit. They also offer the ability to rent the entire arena for $300 and offer many "team building" exercises and events. However, for casual play, it is a bit expensive at $7 a game. 09. Replay FX located at 1000 Fort Duquesne Blvd, Pittsburgh, PA 15222 Downtown for one week only July 28th - 31st (2016). This is an annual "Pop up arcade" convention that features over 2,500 arcade machines - with guests bringing their own units as well. Not only that but it also has cosplay, table top gaming, and console gaming. It's held every year in Pittsburgh and attracts thousands of gamers from all around the world. Since it's only there for a few days - it is not to be missed. Ticket prices vary - you can do a day pass for under $30 or stay all 4 days for under $100. You can also participate in tournaments and earn real cash prizes. The location is great especially for those not from the area as the convention center is close to hotels, shopping, and dining. 08. Ace's Breakaway and Play located at 417 Smithfield St Pittsburgh, PA 15222 Downtown - This is a tiny little arcade with about 20 different games. The games are well maintained and in good working order. The location is good if you live downtown but probably not so good if you're coming in from outside the city due to traffic and lack of parking space. However, the staff is very friendly and the prices are great - you will need to bring change or small bills to use in the change machine. 07. Pinball Perfection located at 231 Perry Hwy Westview, PA 15229 West View. This is a really neat Pinball "Museum" - they also sell and repair pinball machines as well. It's funny then, that so many of their own dang machines are always out of order and in need of bad repair. However, there are hundreds of machines and they are really old - dating back to the 1940s and onwards. This place has pinball machines that you just will not see anywhere else in the world. Hours of operation and prices also beat many of these other arcades on our list. 06. 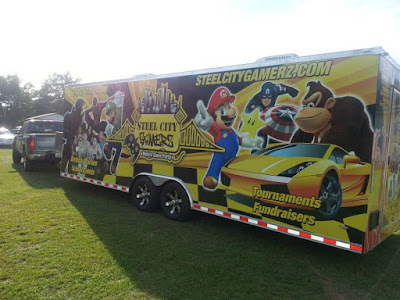 Steel City Gamerz located at YOUR HOUSE (or local Business) - This one just HAD to go on our list because it's so unique! This is an "Arcade on wheels" that you can rent for your party or event - How cool would this puppy be at a wedding reception? Especially if the bride and groom are both gamers - Of course, it'd be equally as awesome at a children's birthday party or any other special event. My only complaint - they have no Playstation 4 - only one Playstation 3 - meanwhile they have like 6 Xbox 360s and 2 Xbox Ones and 4 Wii U's - What gives?! Where's the love for Playstation?! Not even ONE PS4? - It has theater style seating inside and multiple huge flat screen tv's for your gaming needs. It also comes equipped with over 100 different games - and if you don't see a game you'd like, you can make a special request to have it included. - They are VERY pricey though - $325 for 2 hours - you can go out and buy an Xbox One or Wii U or PS4 etc for about that price and have it forever - therefore this is really only something to do for the "experience" and "novelty" of the idea. 05. Bradish Street Pinball Palor located at 1111 Bradish St Pittsburgh, PA 15203 South Side. This is a really great place to play pinball. They have some of the best maintained machines in Pittsburgh as well as a great selection. The only reason I can't score it higher on our list is because of the ungodly hours they keep. They don't open until 5pm (7pm on the weekends) making this a no-go for families as you're likely to be preparing dinner for the kids or not wanting to stay out late. Like many other arcades on the list, this one is BYOB which shows that they want to appeal to adults. If you are kid free and enjoy the "night life" and staying out til 2am in the morning, Bradish Street Pinball Palor is pretty awesome. They even have pinball tournaments making it more exciting and competitive. When tournaments are not going on, you can pay $15 to play all day, making it an excellent and cheap night on the town. 04. Games n' At located at 2010 Josephine St Pittsburgh, PA 15203 South Side Slopes. If you love retro games, Games n' At should be your first stop. They have a multitude of different retro gaming consoles as well as old school arcade systems from the 80s and early 90s. Adults will also appreciate the BYOB policy which helps keep costs low. A local favorite - many people rave about the "Duckpin Bowling" which Games n' At is particularly known for. They also have several pool tables and air hockey machines. However, Games n' At is in a somewhat dangerous location, making it not ideal for families or for visitors from outside the city. The building itself is also not as well kept as some of the other arcades on the list - and to make matters worse, many of the games are also in bad need of repair - this is however a common problem for many arcades. Overall, Games n' At is a local hidden treasure and a true step back in time for fans of retro video games. Be sure to call before you visit or check on google to see if they are open. They keep weird hours and only open about 3 or 4 days out of the week. 03. Victory Pointe located at 1113 E Carson St Pittsburgh, PA 15203 South Side. Victory Pointe is a clear winner for selection and variety of games. They have literally everything from DDR to fighting to shooting to racing games. Many popular games too such as Mario Kart and Battletoads to name a few - Like Games n' At, this is another BYOB establishment which helps them attract adults who are on a budget by allowing them to bring their own alcohol. This place is much better maintained, cleaner, and less "Seedy" feeling than Games n' At. Not only are the grounds themselves neatly maintained, but the games inside as well. This gives it a clear edge over other Arcades in the area who allow their games to slip into disrepair. The staff here is also really great. I also like that they have seats at the machines which makes for a more comfortable gaming experience. The only thing I would improve is getting some larger monitors for the console games. Their food is comparable to Dave & Busters - but much more reasonably priced. You can also get a "play all day" pass which will give you access to unlimited gaming for your stay - making this a great place for families or large groups. 02. Dave & Busters located at The Waterfront 180 E Waterfront Dr, Homestead, PA 15120 - Okay, I know this is not "distinctively" Pittsburgh. And it may not be as "hipster" or "indie" as the other Arcades on our list - but I love Dave & Busters. It's like a "Grown Up Chuck E Cheese" - Since they are a national chain they have money in their pockets to get all the latest games and keep them well maintained. Their food is delicious though quite expensive. I like that you can preload your gamecard online at home or via the kiosks in the restaurant and that you can save your card and reuse it again and again. They have some amazing prizes that you can win if you frequent the place often enough such as gaming consoles and electronics. And these gamecards can be used at any Dave n Busters which makes it great for those who travel or visitors from out of town. Not only that, but this particular Dave N Busters is at an excellent location. The waterfront is a beautiful, newer, shopping complex with lots to offer, in a great neighborhood with ample parking. After you dine and play your games you and your friends can spend time browsing the shops and other areas. For those who are traveling from out of town or entertaining out of town guests, there's also many hotels at the Waterfront as well. 01. Kickback Pinball Cafe located at 4326 Butler St Pittsburgh, PA 15201 Lawrenceville takes our spot for the best arcade in Pittsburgh - although it only has Pinball machines and doesn't offer the variety of some of the other arcades on our list - the service, prices, location, and "Pittsburgh-ness" of this arcade, secure it in our number 1 spot. Kickback Pinball Cafe is like "Panera Bread with Pinball Machines" The food is very similar to Panera Bread and is priced very reasonably with meals under $10. It's healthy, with salads, sandwiches, smoothies, teas, etc. And it's pretty tasty too. This is where all the "hipster" kids want to be, and for good reason. It's a relaxing and trendy atmosphere with a lot of games and just a great place to hang out. It's clean and well maintained and they add new games to their lineup regularly which keeps people coming back to see what's new. Also, like Games n' At this one is BYOB, which the adults love! Regardless of which gaming experience you choose, you're sure to create a memorable outing that will have friends and family members talking about this trip for a long time to come. Pittsburgh has a lot of great things to offer - and their selection of arcades is no exception. Sean's Note: I had no idea there were so many arcades in Pittsburgh. I want to go to there! 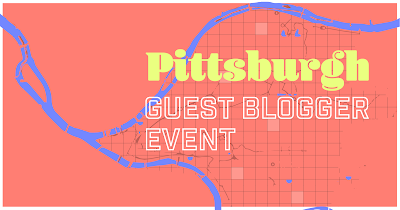 In the meantime, please make sure to visit all of the great bloggers participating in this annual Pittsburgh Guest Blogger Event!